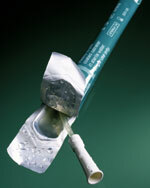 The SpeediCath is the first ready-to-use sterile, pre-lubricated catheter for intermittent catheterisation for single use only. It is packed in a sterile saline solution that eliminates the need to prepare the catheter before use. Size: 14 in. Length and comes 8 - 18 Fr. Quantity: Sold individually - order as many as you want! Catheter was well lubed and easy to get started, but it was too inflexible for me. It was uncomfortable when passing through prostate into bladder.